3 Comments March 15, 2018 Like? In this live broadcast, Chief Engineer Matt Davis reviews the NDI upgrade process for PTZOptics cameras. Enjoy a fun NDI Trivia to test your knowledge of the NewTek NDI along with a detailed review of the NDI Upgrade process. Our host Tess Protesto introduces our lead engineer Matthew Davis for a fun trivia session refreshing our knowledge about the Newtek NDI. We cover what NDI stands for (Network Device Interface), the standard bandwidth consumptions (8-10 Mbps) and many other basic IP video production basics. 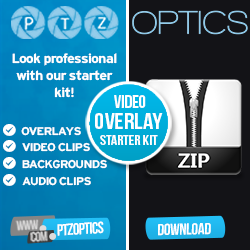 If you are an IP video production pro skip the first twenty minutes of the broadcast and check out the detailed review of updating a PTZOptics camera to support the NewTek NDI. If you have any questions about the NewTek NDI upgrade process you can submit a ticket at help.ptzoptics.com. Our support team is ready help you with your next IP video production project involving our PTZ cameras. Just give us a call or send an email to [email protected] I have posts below a list of common troubleshooting tips for setting up your cameras with Multicast, setting up your cameras NDI mode and more. Issue #1: Multiple cameras only show one NDI feed. Pulling in other cameras results in only one feed coming through from one camera. Or any camera not pulling in their own feed. Issue: Black screen when pulling in registered and firmware upgraded camera. Solution 1: Either of these issues can be caused by the NDI mode not being on, or Multicast being on. Go into the cameras IP interface make sure NDI mode is set to low/medium/High in the video settings and click apply. Now turn off Multicast in the Network settings, and click apply. Once this complete please be sure to power cycle your camera. Please note that changing your NDI mode will automatically turn on Multicast. Be sure to turn this off unless you are sure you are on a Multicast enabled network. A firmware fix will remedy this issue in the future. Solution 2: There can also be an issue with the negotiation between the camera and the PC via the switch. Usually, this can be resolved by re-booting the receiving PC. And this would only be applicable if you know you have a multicast-enabled network, and multicast enabled on the camera. Solution 3: The other thing that can cause a black screen is using the wrong Studio Monitor program to view your feed. You need to use the NDI/HX Studio monitor, not the one for NDI Tools. Newtek has both of these posted so grabbing the correct one is important. It can be downloaded here.